BCB, manufactured by Dow Chemical Company, is used by many of our customers. The refractive index of BCB varies significantly with type and with curing. The thickness result scales directly (inversely proportional) with the index of the material file used. Thus the accuracy of the thickness results depend upon using an accurate material file. 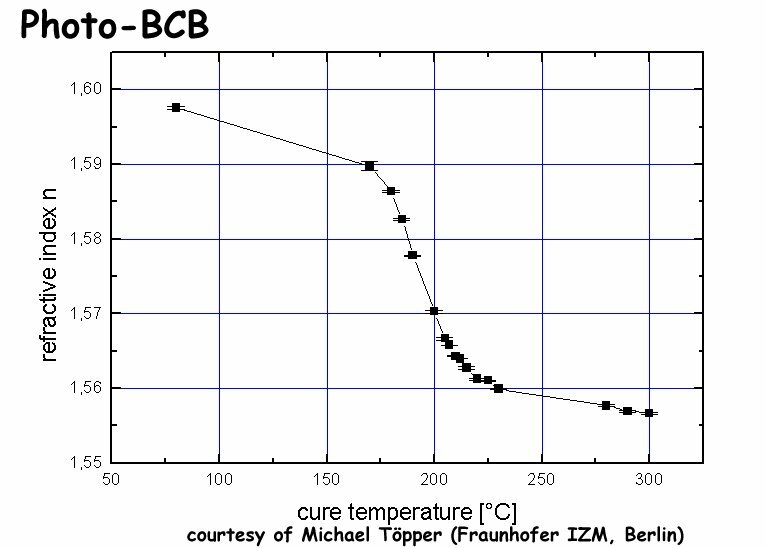 Figure 1 shows how BCB changes with curing at a fixed wavelength. Thus customers should realize that their thickness results may be shifted if they are curing at a different temperature relative to the material file's cure temperature. For instance, the approximate index difference between a soft and a hard cure may be 2% (0.03/1.575); this would make the thickness results be 2% too small if your hard-cured BCB were measured using a soft-cure based BCB material file. Figure 2, taken from Dow's web site, shows how the different forms of BCB (photo vs. non-photo) have very different indexes. Additionally, exposure may change the index properties.